Hey Mother Nature… BITE IT! 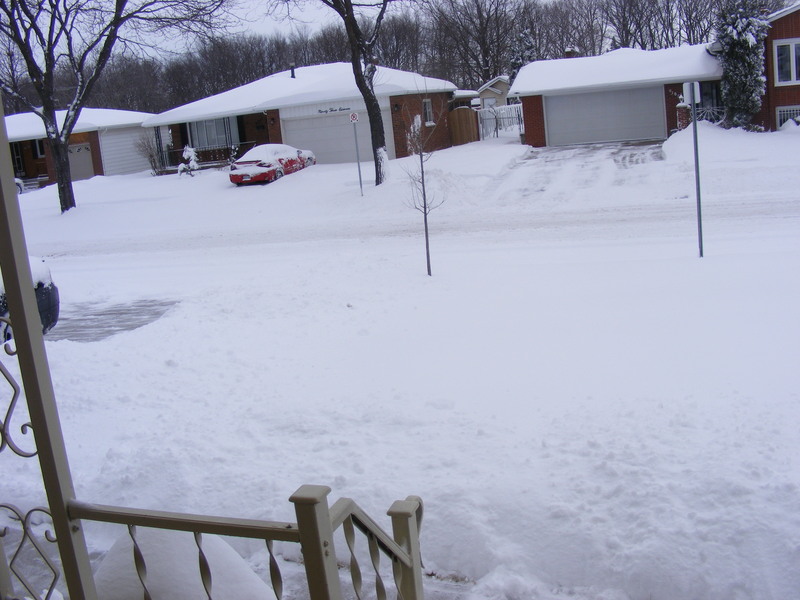 I’ll admit, I whined and cried that in the Netherlands you never really got a “real” winter like you do here in Canada. I missed a good snow fall that would last for days. I miss the cold crisp air. I missed the sun gleaming off the snow banks. That was of course until last night. Southern Ontario got nailed again this winter and Mother Nature is a cruel woman to boot. First we had a huge storm come through at the beginning of the month. Then a few days ago it warmed up to the point you could run to the car with out a jacket and now this is what I woke up to. It all started yesterday around 2:30pm, light flurries, pretty little flakes gently falling from the sky. But then in a matter of minutes the ground was covered and in a matter of hours we had a few inches on the ground and today we have that. Now you’ll notice the driveway and sidewalk are shoveled, this is the second time my brother did that. He shoveled last night too and it was basically covered again in a matter of moments. Today I was going to take Isabella to Monkeytown today but I have a feeling the drive there would be less than pleasant so we’ll postpone. I do hope that the roads will clear up so that I can get her pictures done today. This will be attempt number 3 for us. Now back to the snow, I know that my readers in the great white north will scoff and laugh at the snow we have, but remember THIS HAD ALL MELTED!!! Mother Nature gave us a taste of spring then slapped us in the face. She’s a mean lady that Mother Nature… mean mean mean. This entry was posted in Weather and tagged Mother Nature, snow, weather. Bookmark the permalink. 4 Responses to Hey Mother Nature… BITE IT! Holy that was fast! LOL!! Amen to that! It was such a cruel and evil tease. From green grass to me shovelling slush at the end of the driveway.